The What: Audio-Technica is now shipping two new packaged configurations of its popular System 10 PRO Rack-Mount Digital Wireless System: ATW-1366 System 10 PRO Rack-Mount Digital Wireless System with Boundary Microphone/Transmitter and ATW-1377 System 10 PRO Rack-Mount Digital Wireless System with Microphone Desk Stand Transmitter. The What Else: The ATW-1366 configuration includes ATW-RC13 Rack-mount receiver chassis, two ATW-RU13 receiver units, and two ATW-T1006 System 10 Boundary Microphones/Transmitters. The ATW-1377 configuration includes ATW-RC13 Rack-mount receiver chassis, two ATW-RU13 receiver units, and two ATW-T1007 System 10 Microphone Desk Stand Transmitters. 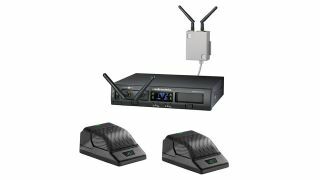 The ATW-1366 and ATW-1377 System 10 PRO configurations are now available as follows: ATW-1366 System 10 PRO Rack-Mount Digital Wireless System with two Boundary Microphones/Transmitters: $1,349; ATW-1377 System 10 PRO Rack-Mount Digital Wireless System with two Desk Stand Microphones/Transmitters: $1,249.00. The Bottom Line: Previously, the ATW-T1006 System 10 Boundary Microphone/Transmitter and ATW-T1007 System 10 Microphone Desk Stand Transmitter were available as individual components, as integrators/contractors generally source these pieces separately to configure a system to spec. To simplify the ordering process, Audio-Technica has decided to offer the transmitters and receivers together as turnkey packages.